This impeccably recorded disc is strongly recommended. A discographic coup (...) that marks Raekallio as a major pianistic talent. 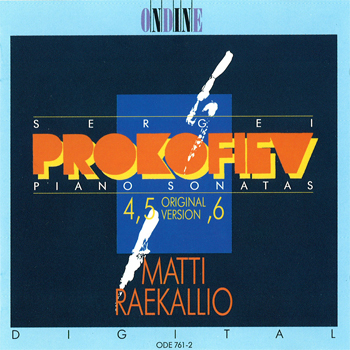 This CD is the third volume in a cycle featuring Matti Raekallio with the complete piano sonatas by Sergei Prokofiev. It contains the sonatas nos. 4, 5 (original version op. 38 of 1923) & 6. Matti Raekallio is one of Finland's foremost pianists and numbers among the most sought after pedagogues internationally. For this release, he also provided the liner notes. The complete series is available as a boxed set (ODE947-3T), hailed by Fanfare Magazine in 1991 as, "the most proficient, intelligent and compelling Prokofiev sonata cycle I've heard!"